I'm not entirely sure how to begin this review. I've been wanting to read Fingersmith for the longest time and I just never got around to it. Then, last Christmas, I got the BBC adaptation on DVD and I'd heard great things about it as an adaptation, but there was no way I was going to watch it before I'd read the book. That might be one of the best literary decisions I've ever made, because if nothing else this book is an experience. If I told you I started this book in March and finished it in August, you'd probably assume it was a bad book, but the truth is I just wanted to savour it. I easily could have read it in two or three days, but I wanted to drag it out and keep that suspense going, because this is the twistiest, turniest book I have ever read. I don't like to blow my own horn, but I'm pretty good at guessing what's going to happen in books and films, but this book blew me away. There's more than one big twist, and when the first one happened I was sat in bed sucking all the air from the room into my lungs I was that shocked. I wanted to talk to someone about it, but it was three in the morning. If that's not the sign of a good book, then I don't know what is. I loved everything about this book. I loved the setting, I loved the way it was written, and I loved the characters. Sue has quickly become a favourite of mine - I thought she was lovely and honest, despite being a thief, and one of those characters I just wanted to hug. It took me a little longer to warm to Maud because I wasn't sure what to make of her, but that's one of the things I love about Sarah Waters; she doesn't write characters, she writes people. Maud is complex and honest in a different way - perhaps brutally so - and I think the relationship between her and Sue is one of the best romances I've read in a while. If you're unfamiliar with Sarah Waters, she primarily writes historical fiction with LGBT* characters at the centre, which is fantastic. What I love about the way she writes, though, is that the books are never about sexuality, at least not in the obvious sense; she doesn't write books about people coming to terms with their sexuality, she writes about relationships in the same way that heterosexual relationships are written about. When a woman falls in love with a man, she doesn't have to come out as straight. She isn't met with questions like: 'are you sure you're straight? Maybe it's just a phase', and Waters doesn't do that to her characters either. I can't recommend this book enough. Whether you like historical fiction or not, give it a try. Sarah Waters might specialise in historical queer fiction, but they're never history books or books about being queer, they're books about ordinary people, like you and me, with extraordinary stories. Wow, I think we had very similar experiences reading this book. This was my first Sara Waters book, and it blew me away. I was gasping out loud at certain points. Simply brilliant! I agree with everything you said in your review!!! It's a fantastic book, isn't it? :D I'm looking forward to reading more of Waters' work! 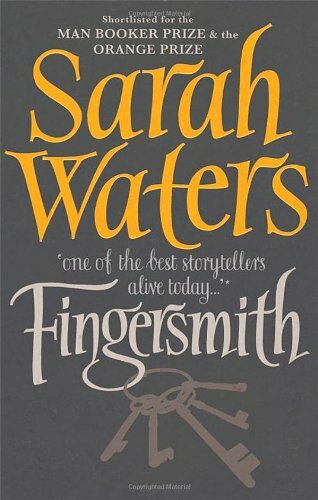 This is my favourite book by Sarah Waters, no doubt. I don't usually go for romances but Sue and Maud moved me. Although Sue is a character you like very soon (because she starts being quite naive) Maud was the one that really haunted me, even if sometimes her motives and ways are a bit arguable. She is so interesting and smart, it's so refreshing to read female characters like her. The Victorian setting was and the irony of the plot were also a great point in this book. As you, I would definitely recommend it! Great blog, by the way. I agree, I think Maud is a brilliant character. I fell in love with Sue, but I think I identified with Maud just a little more. Thanks! I definitely recommend giving this a read. :) So far I've read two of Waters' books, and I've almost finished a third and I recommend them all! I don't recommend starting with Affinity, though, because it's probably her gloomiest novel and I think it gives off the impression that all of her novels are depressing when they aren't at all.